My wife says if you have too much elk she would be glad to help you get rid of some. If you ever come up towards the Poconos give me a holler. I’m always on here and I don’t mind traveling a little. Always looking for new watering holes. I had this guy walking past a cam within 25 yards of my stand. Still nocturnal. I did have a 4 point come by a couple days ago too. After having my crossbow at the range yesterday, I'm giving up on it for the year. I had the safety jam on it once and I can't get it to hit consistently at all, even on a rest. Time to go back to the drawing board. Hopefully, I'll be out with the smoke pole here in a few weeks. I have yet to see a shootable decent buck in my back yard. I have had this forkhorn coming by a few times. I went to a fire pit party and found out a buddy of mine shot the 9 point that i had on camera but only at night behind my place. 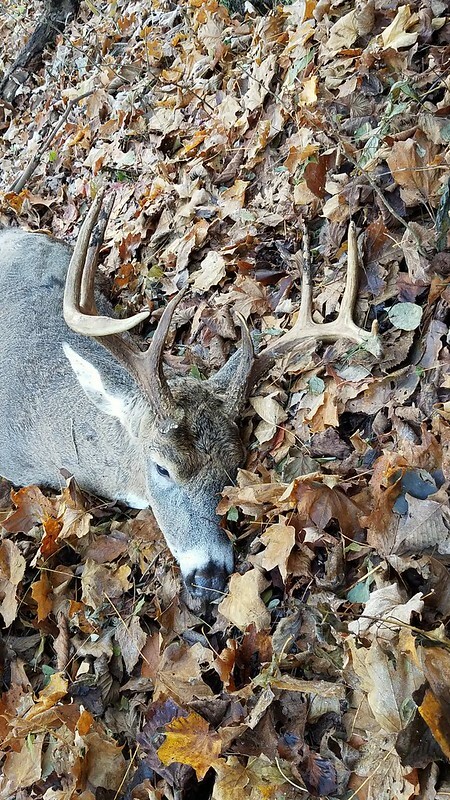 Another friend shot at a 10 point in Somerset but thinks he hit a branch. A few spots of blood an a bit of fur. 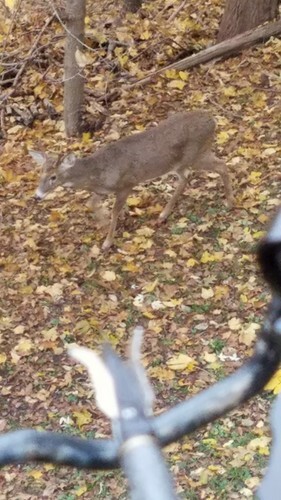 I set up 2 cameras at my friends camp north of Tionesta, got deer on both , got a blurry pic of what looks like a shooter ( neighbor says its a pretty decent buck ). I have yet to even see a doe back there but did see a few daytime pics of doe. Well, In 2B I still can hunt till Nov 24th. I did shoot last years 8 point with a crossbow in rifle season so I'll be out tomorrow AM and a few more days here and there. Ah the smell of decaying leaves, need some blood on them 27hand. I'll happen, lots of time left and late season as well! It's funny how early on, there were plenty of deer on my cams and now I get a few doe at 3AM. The forkhorn is good to see. My buddy down the street says he had almost none on camera early and now calls them by name. If nothing pans out before rifle, I'll be in Tionesta area and Avella. Late season, my friend with 100 acres asked if we could hold off shooting any doe on his farm so it may be backyard most of the time. It's all good. I heard an owl this AM at 615. First one in years. I have your fingers crossed for you and me!! Well Gunowner99. I thank you for having my fingers crossed for me. The 9 point I thought my neighbor up the street shot came by about 7:30 from my left with nose down and walking with purpose looking for a doe. I had my crossbow in my lap, saw him out of the corner of my eye, put the crosshairs high on his back and made a good quartering away shot. I was concerned that he ran the 90 yards I could see without falling. I got there about 20 min later and found him down. The drag back and up my steps was a bit tough but im still able at 69. 3 of my buddies said they were close enough to help. Gunowner99. Hopefully, your fingers are crossed for you. Good luck. Last edited by 27hand; November 8th, 2018 at 05:15 PM.